Luella is a bright and exotic cluster of classic white Asiatic Lilies, sensational pink Dendrobium Orchids and luscious Tropical Greenery which together, form a winning combination. Send Luella to people who appreciate beauty with an exotic touch.Lilies may be sent closed/partially closed in order to prevent damage and to last longer.Vase not included however for a lasting impression we recommend a standard vase to perfectly complement Luella. 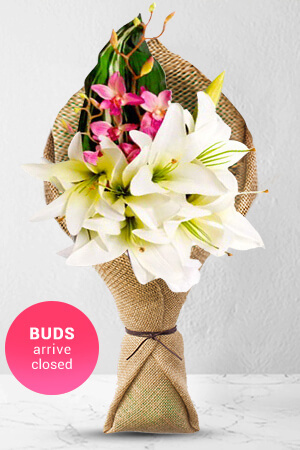 Most standard floral orders delivered to metropolitan areas have a reduced delivery charge of 10.00USD. Great. Did I miss the chance to say something on the card or was it not available? The recipient of the flowers was thrilled, and service was very quick.